Looking For The Best Brush For Medium Hair Cats? Here’s a look at our favorites, including our top pick – Pet Grooming Glove – Enhanced Five Finger Design – Gentle De-Shedding Brush. 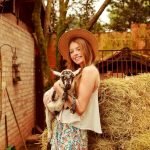 Do you love your cat but can’t stand the shedding? How about those lovely hairballs that seem to pop up when you’re least in the mood to clean them up? Both of those can be frustrating, but they’re much more manageable when you groom your cat regularly. 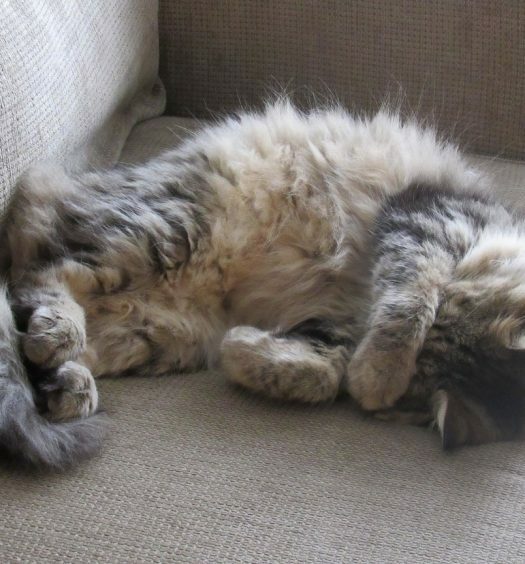 Brushing your cat every day only takes one or two minutes, and it significantly reduces loose hair and tangles. That means less hair floating around the house, and less hair for your cat to lick up and turn into hairballs. Daily grooming is also great for your cat’s coat and fur, as the bristles stimulate the skin and promote better blood circulation. Pin brushes – pin brushes are best for cats with medium-to-long hair. Wired pins do a better job of reaching down to the cat’s skin without getting matted in their hair. Look for pin brushes that have rounded tips, as these are gentler on your cat’s skin and less likely to cause irritation. Bristle brushes – bristle brushes are ideal for cats with short hair, or for lightly dusting off dirt, loose hair, and dander from the top of a longer-haired cat’s coat. 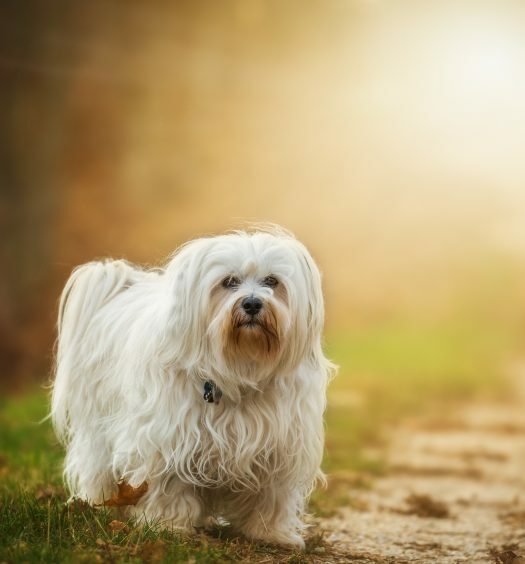 Cleaning – with some brushes, cleaning up the matted hair after each grooming session can be a pain. Look for brushes with features that make cleaning the brush easier, such as widely spaced pins or a self-cleaning button that lets you wipe away the hair. If your cat hates to be groomed with a brush, I’d highly recommend trying a pair of Pet Grooming Gloves. 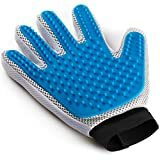 Instead of using sharp metal bristles that can irritate cats, these gloves use rubber grooves that are firm enough to catch hair but soft enough to soothe your cat’s skin. In short, it’s more like a massage than a grooming session. The enhanced five-finger design makes it easier to groom hard-to-reach and sensitive areas, and the ability to use both hands while grooming makes the whole process significantly faster. They’re also water-resistant, so you can use them during bath time to get a deeper clean for your cat. The company backs these gloves with a money-back guarantee, so if you and your cat aren’t satisfied you can return them for a full refund. Can’t decide whether you need a pin brush or a bristle brush? Consider buying a grooming brush that offers both! The GoPets Professional Double-Sided Pin & Bristle Brush offers the best of both worlds—the bristle side easily knocks off loose hair and dirt, while the pin side leaves your cat with a beautifully groomed coat that’s especially useful for medium-to-long haired cats. 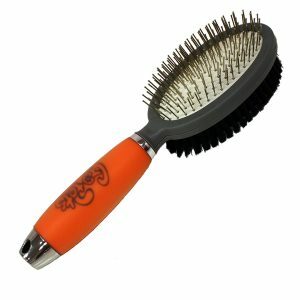 The pin brush utilizes rounded ends for an easy, comfortable grooming session, and the bristles are designed to penetrate deep into the coat without scratching or irritating your cat’s skin. GoPets also has your comfort in mind, so they designed the handle with a non-slip silicone gel grip that’s incredibly comfortable and conforms to your hand. All GoPets products are thoroughly tested for quality, and the company offers an unconditional lifetime satisfaction guarantee. Best of all, 10% of the proceeds from all purchases are donated to pet charities, so you can feel warm and fuzzy knowing that your purchase does a little good for the world, too. The Hertzko Self-Cleaning Slicker Brush is the best choice if you’re looking for a brush with the easiest cleanup. When you’re done grooming your cat, a simple single-push button retracts the bristles, so you can easily wipe away the hair with a single swipe. The bristles are made with fine bent wires that are designed to penetrate deep into your cat’s coat to groom the undercoat without scratching or irritating the skin. Based on the extensive customer reviews, it does a fantastic job of gently removing loose hair and eliminating tangles, knots, dander, and trapped dirt. The brush is also designed to increase blood circulation, so your cat will have a healthier, softer, and shinier coat. It also has a comfort-grip with a no-slip handle, so you don’t have to worry about a cramping hand every time you groom your cat. Of course, like all of the other brushes we’re discussing today, this product is backed by a 100% money-back guarantee, so it’s a safe purchase if you’re on the fence about which one to buy. 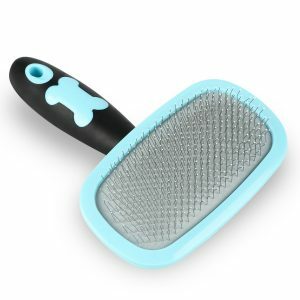 The Glendan Slicker Pet Grooming Brush is another great pin-style brush for medium-haired cats. The brush takes care of tangles, mats, dander, and trapped dirt, and the rotatable slicker brush makes it easier to groom hard-to-reach places. It’s easy to clean after each grooming session, and it has a comfortable, anti-slip handle. 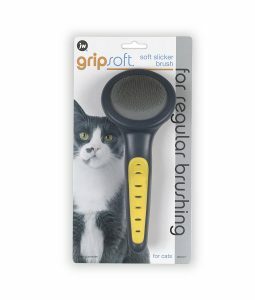 You can’t beat the value of the GripSoft Cat Slicker Brush. It’s a solid choice for everyday grooming with gentle, angled pins that keep your cat’s coat clean, soft, and tangle-free. 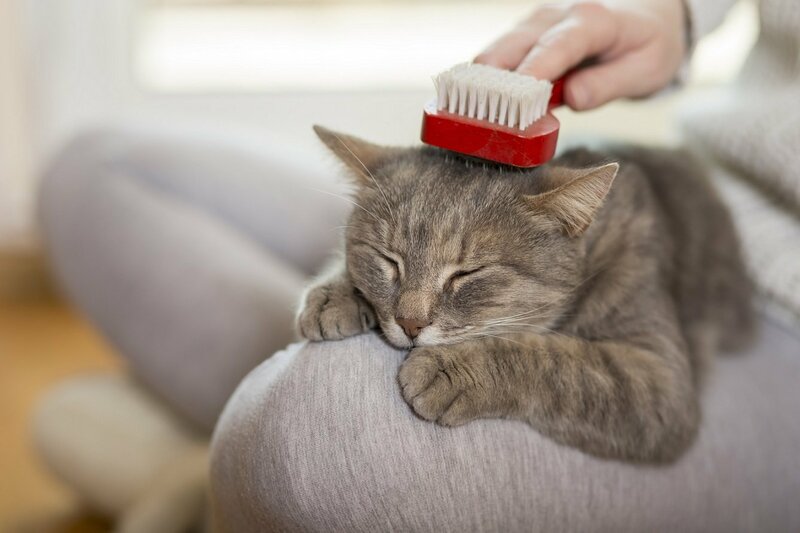 The ergonomically designed handle makes the brush comfortable and easy to hold, so it’s a great grooming experience for both you and your cat. 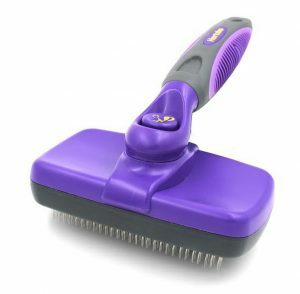 If you know you need a pin brush based on your cat’s hair length, I’d highly recommend the Hertzko Self-Cleaning Slicker Brush. It’s great for cats with longer hair, and it’s a piece of cake to clean up after each grooming session. If you can’t decide between a pin brush and a bristle brush, go with a double-sided option that gives you the best of both worlds. And if your cat absolutely despises grooming with a brush, I’d definitely recommend trying the Pet Grooming Gloves, as they’ll let you gently collect loose hair while naturally petting your cat.